My husband and mother and a whole squadron of friends and helpers are covering for me -- the documentation for How To Run This Household When I'm Not Here is seven pages of 10 point text. So I'm not worried about being gone, and am profoundly grateful to everyone involved. I am worried about missing my family, though, and having them miss me. So of course I made Leo a Kid in Story interactive book about going on a trip, where I'll be, why I'm going, how long I'll be gone, who will be with him while I'm gone, and that I will definitely be coming back. He liked the story, especially the part about me going on a train in England (that Thomas the Tank Engine conditioning perisists, it does). Since I will be 8 hours ahead of Leo for the first week, FaceTime will not always be an option. 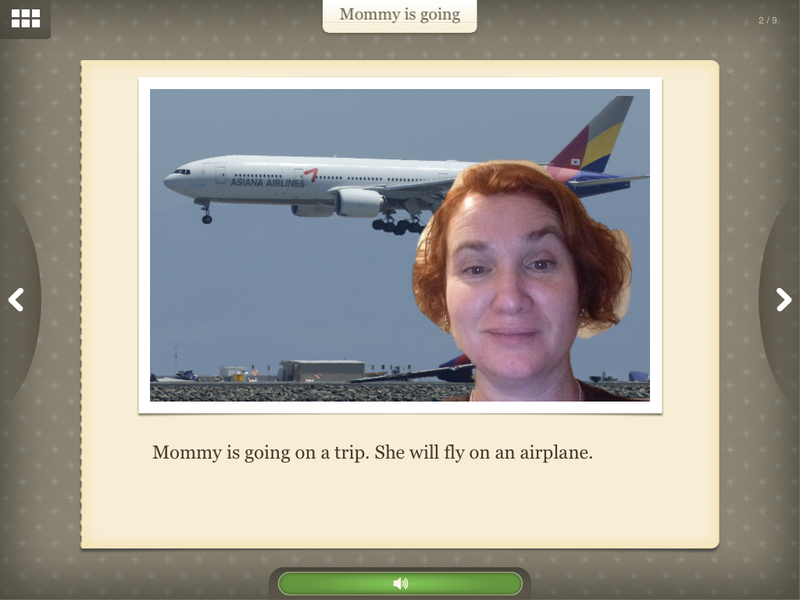 But with the Kid in Story app, he can independently see my picture, hear my voice, and reassure himself that I'll becoming back soon -- as many times as he wants to reassure himself. I also made him a bunch of KiS versions of his favorite books, so I can "read" them to him even when I'm not there. I talk about the Kid in Story app all the time -- even in Bay Area Parent just this week -- with good reason. It's an affordable, easy-to-use story creation app. And its free companion Reader app lets you share any story you've made with any person who has access to an iDevice. It took me 30 minutes, tops, to create a nine-page story with custom photos, text, and voiceover, and then share it with Leo's grandmother, dad, and teacher. Leo will be able to reassure himself I'll be coming back, wherever he goes. And knowing he'll be reassured makes it less difficult for me to leave his side for such a long stretch. So cool you made the story for him, such a loving thing to do. I'm sure it will continue to give him a lot of comfort. And what a great app!